In a world full of product placement and sponsored content, theatre is often considered to be an art form unsullied by capitalist demands. Prairie Fire Please’s Everyone Wants A T-shirt!, playing at the Theatre Passe Muraille Backspace as part of the 2018 Toronto Fringe Festival, however, creates a theatrical space saturated with empty slogans and branded merchandise to satirize capitalism’s endless ability to claim, corrupt and commodify even the noblest ideals. It doesn’t take long for Beatrice Little (Brittany Miranda) to sell everything she’s got. Desperate for success, she finds herself caught up in a pyramid scheme that cheerfully exploits her womanhood, race, and relationships. By hawking dubiously feminist t-shirts, she tries to convince herself she is empowering herself and her customers, but her determination and denial soon get the better of her. Everyone Wants A T-Shirt! is bursting with a speedy, nervous — perhaps even millennial — energy. Director Aaron Jan does clever work in harnessing that energy to enhance the themes of the show. With deal-sealing handshakes that propel the actors across the space, rapid-fire dialogue, and sharp transitions, the frantic march of globalization is felt in each vital moment. Some of those moments are more vital than others, however. The character of Agatha (Madeleine Brown), who draws Beatrice into her crooked business, feels underdeveloped, especially when compared to the bombastic antics of the villainous Eugene (John Wamsley). The show also struggles to find much use or resolve from the domestic subplot of Beatrice’s betrayed business partner, Morgan (Wamsley again). These roles feel functionary and distract from more compelling roles, like Brown’s turn as schoolyard bully Jennifer. The relationship that feels the most important, and is a bit overlooked, is that of Beatrice and the tortured artist Dort (Charlin McIsaac). Once Beatrice convinces the aimless Dort to find inspiration in her vapid mantras, she creates an entire exhibition of oblivious white feminist art, tampon sculpture and all. The show’s meta commentary on the relationship between art, capital and social trends are urgent, and can’t help feel just slightly lost amongst the bustle of the show. And the last moments, featuring a loaded conversation between Beatrice and the happy-go-lucky, scootering spectre of late capitalism (Wamsley), feel like they hit their points just a little too late in the game to have their desired impact. Everyone Wants a T-Shirt is fast, funny and takes pleasure in posing complicated questions about how products influence our relationships to one another. It’s too bad they’re not selling any merch. 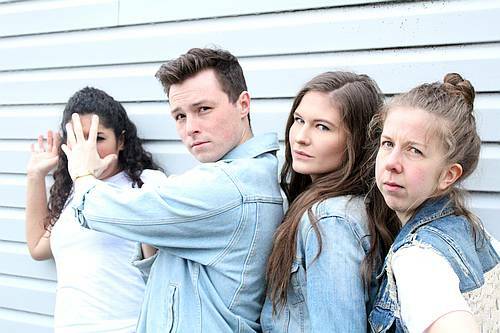 Photo of Brittany Miranda, John Wamsley, Charlin McIsaac and Madeleine Brown by Graham Isador.